The trinidad+tobago film festival (ttff) continues to expand its community film outreach programme with T&T Film Nights. From 16 November to 01 December, the ttff will present a series of five free community-based film screenings in Moruga, Mausica, Maracas Bay, Matura and Buccoo in Tobago. T&T Film Nights is an ongoing series of free community cinema sponsored by the Trinidad and Tobago Film Company, one of the ttff’s leading sponsors. 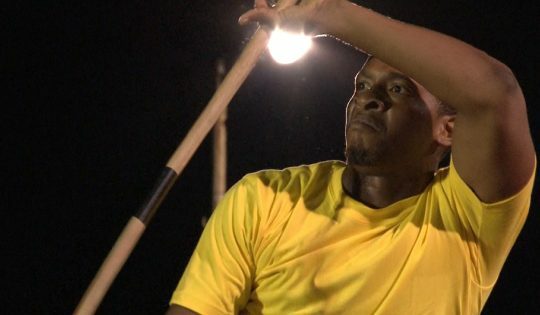 On Saturday 16 November at 6pm residents of Moruga will have the opportunity to see No Bois Man No Fraid, an uplifting and eye-opening documentary on stickfighting set in the Moruga community. 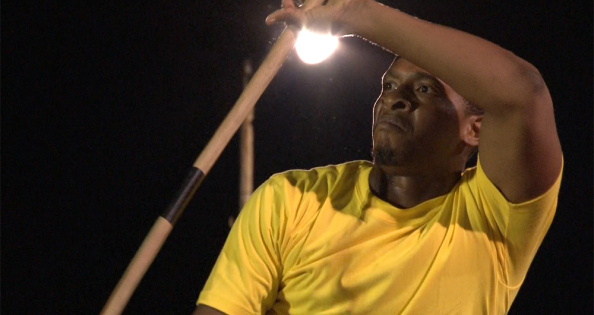 A ttff/13 selection directed by Christopher Laird, the film is based on story of Keegan Taylor and Rondell Benjamin, two young martial arts experts from the Moruga Bois Institute. Taylor and Benjamin are also producers of the film and will join Laid in a question-and-answer session after the film, which screens at the Moruga Composite School. Then on Wednesday 20 November, in a closed screening, cadets of the MILAT Military Academy in Mausica will learn about the healing, transformative power of music through another ttff/13 selection, Songs of Redemption. The story of a music rehabilitation programme in a Jamaican prison, the film was co-winner of the Jury Prize for Best Documentary at the ttff/13, as well as the People’s Choice Award for Best Documentary. Co-director of the film Miquel Galofré will attend the screening. Pothound, the popular short film by Christopher and Leizelle Guinness, will also be screened. The following Saturday, on 23 November, the Maracas Bay Community Centre will be transformed into a temporary cinema as six short films are screened, from 6pm. Dainia Wright’s Mystic Blue explores the relationship between Mystic, a member of the Bobo Shanti faith, and Blue, a strong-willed woman who does not share her boyfriend’s beliefs. Knockabout, meanwhile, is a T&T-style neo-noir directed by Emilie Upzack. After Mas, directed by Karen Martinez and ttff/13 Jury Prize-winner for Best Local Short Film, is a story about a young man and woman from different backgrounds who meet and fall for each other during J’ouvert. If I Could Fly, by Maryam Mohammed, the story of a little girl who wishes she could take to the sky like a kite, will also join the line-up. Completing the package are One Good Deed by Juliette McCawley—about a young boy’s encounter with some douens—and No Soca, No Life, a rags-to-riches story about an aspiring soca performer, directed by Kevin Adams and starring Terri Lyons. This screening is presented in association with the Maracas Bay Community Council. On Sunday 24 November the ttff teams up with the Nature Seekers group to present another series of short films, at the Matura Secondary School. In addition to Mystic Blue, there’s the hilarious A Home for These Old Bones, a zombie comedy set in Guadeloupe. The package will also include Earth, Water, Woman, the inspiring story of the Fondes Amandes Community Re-Forestation Project; Renee Pollonais’ comedy Sweet Fries; and Til D Well Run Dry, a film by the students of Matura Secondary School. There will also be a presentation by the Ministry of Arts and Multiculturalism on the National Registry of Artists and Cultural Workers. The screenings start at 5:30pm, following Nature Seekers’ Christmas craft and family fair. T&T Film Nights will conclude in Tobago, at the Buccoo Community Centre on 01 December. This event takes place from 6pm in association with the Healing With Horses Foundation, following their annual Christmas Fair. The film being screened are Chrissy!, directed by Marcia Weekes, the inspiring story of a poor 10-year-old girl overcoming seemingly insurmountable odds, and Captain T&T, by Christopher and Leizelle Guinness. Admission to T&T Film Nights is free. Audiences will also receive free T-shirts, bags, cups, popcorn and other giveaways on a first-come, first-served basis.